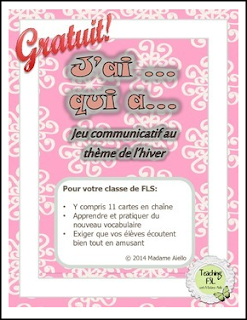 This is a fun but challenging winter vocabulary themed activity appropriate for French Immersion or Core French. It provides your students with some excellent exposure to circumlocution and practice with oral interaction within the target language, as the clues are described in French and no English needs to be used. This free product is an 11 card simplified version of a more robust whole class version also available in my store. It can be used and reused in a variety of ways Siimply reshuffle the redistribute the cards, and students will welcome the opportunity to get a better "time" or score by redoing the activity another day during the winter season or when studying winter in a warmer climate! This is a PDF file but includes a blank card so that you may make your own customizations to best suit your class and to account for regional differences! If you found this product useful, please take a moment to leave a comment. Your suggestions are always welcome too!